Britain should pay Palestinians reparations, aid Hamas in terrorizing Israel, Hamas officials claim. The coordinator of the Palestinian Arab world's "Nakba Day" events has blamed Britain for Israel's existence on Friday, charging it with "theft of natural resources and property" and calling for the country to assist in Palestinian terror groups' retaking of Israel and to pay reparations to "avenge" the "injustice." 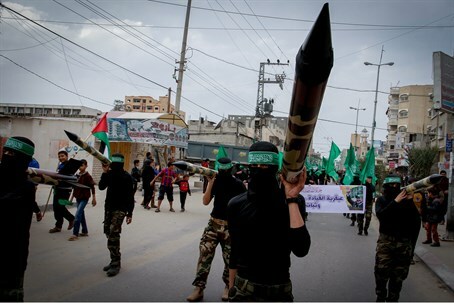 Hamas official Essam Adwan stated Friday that Britain "paved the way" for a "Zionist takeover" by preventing Palestinians from establishing an armed resistance against Jews in 1947 and by weakening the local economy and education system. He also accused the British policy of forced expulsion imposed on the Palestinian Arabs of allowing Jews to "massacre" Arabs by fighting back against those who were launching terror attacks and their own massacres against Jews living in Israel. Adwan cast responsibility for the situation of Palestinians upon Arab countries also agreed to a cease-fire with Israel and after years signed peace treaties with it - most likely referencing Jordan and Egypt. He called on these countries to "correct the error" committed by openly declaring hostility to Israel and instead providing funds for terror groups to "liberate" the country. Adwan called on the PLO as well to return to the concept of "armed resistance" against Israel and occupying the entire country. He called on Palestinian Arab "refugees" in Syria to invade Israel as well, and to utilize the UNRWA and other organizations to flood the country. Palestinian Arabs mark "Nakba (Catastrophe) Day" on Friday as a desecration of Israel's independence. The day has traditionally been accompanied by incitement, rioting, and terror attacks.